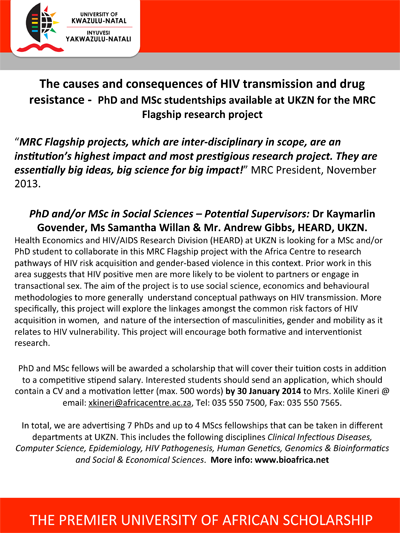 The causes and consequences of HIV transmission and drug resistance - Social Sciences PhD and/or MSc studentships available at HEARD/UKZN Genetics department in collaboration with Wellcome Trust Africa Centre for Health and Population Studies. Funded by a MRC Flagship research project. Potenital Supervisors: Dr Kaymarlin Govender, Ms Samantha Willan & Mr. Andrew Gibbs, HEARD, UKZN.